Here you have the General Library timetable for Easter holidays. The other libraries will be closed. The Economics Library offers you the bibliographic novelties at the library ground floor,. You can have a look or borrow them. In the novelties leaflet you will find some suggestions related to the works displayed. Don't hesitate and come to visit us! This year we the Book Day coincides with Easter holidays. 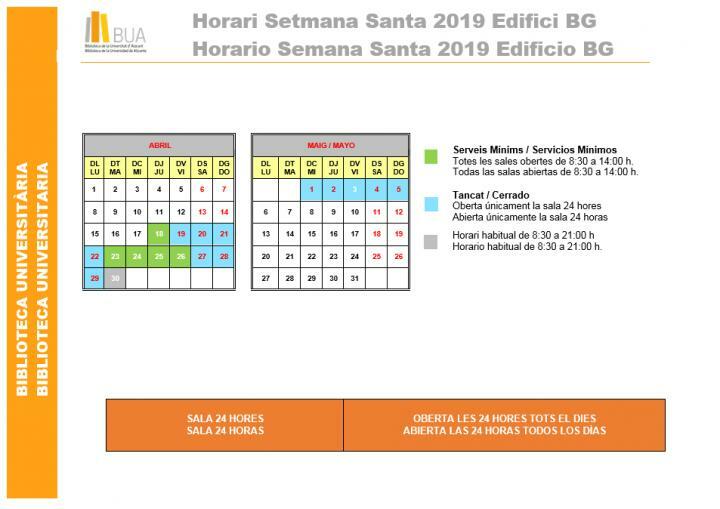 Still the BUA wants to celebrate this special date and with this purpose have we prepared an easy crossword whose resolution will be awarded with 2 vouchers of €50 to buy books in Compás bookshop. You will be able to fill in it from April 12 to May 5. Thematic Guidescontain a selection of information resources classified by university teaching and research subjects, that have been defined by the librarians in collaboration with the teaching staff. On this occasion we present the new Climatology Thematic Guide prepared by the Geography Library. The Media Library (ground floor of the General Library) has opened its 3rd group work room with capacity for four people. It has been provided with a computer and a whiteboard. You can also borrow HD video players. The holidays loan period for manuals begins on April 11. Loan and return holidays periods for all types of library materials. From today March 28th, the Library offers to the students who have obtained a "satisfactory" result in the CI2 courses (Computer and Informational Skills) or in the CID courses (Competences in digital information) an accrediting document of having passed the course. New digital platform subscribed by the University of Alicante. It contains the old Safari Books Online. It includes more than 38,000 book titles and 30,000 hours of video. The database allows unlimited user access.